Traditional kitchens with their Shaker cabinets and ornate pulls will always hold a special place in our hearts. 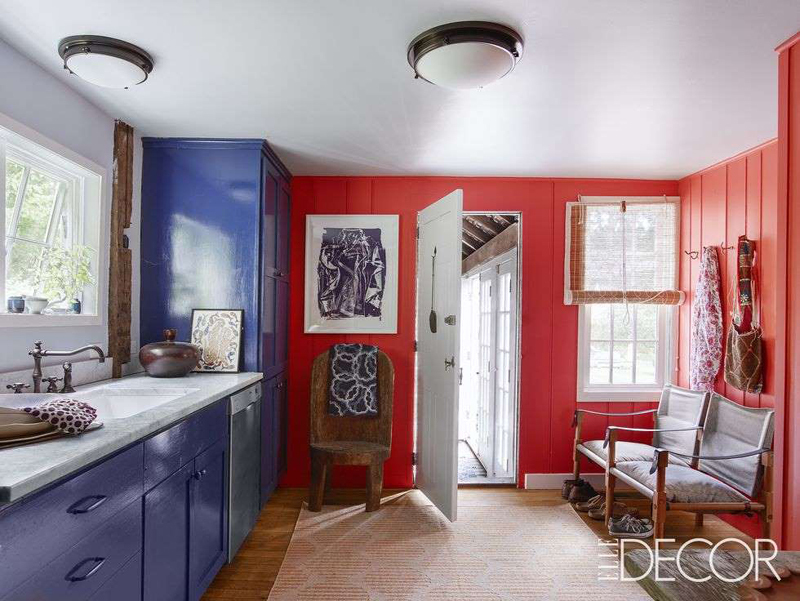 And don't get us wrong-we love an open-shelving moment. 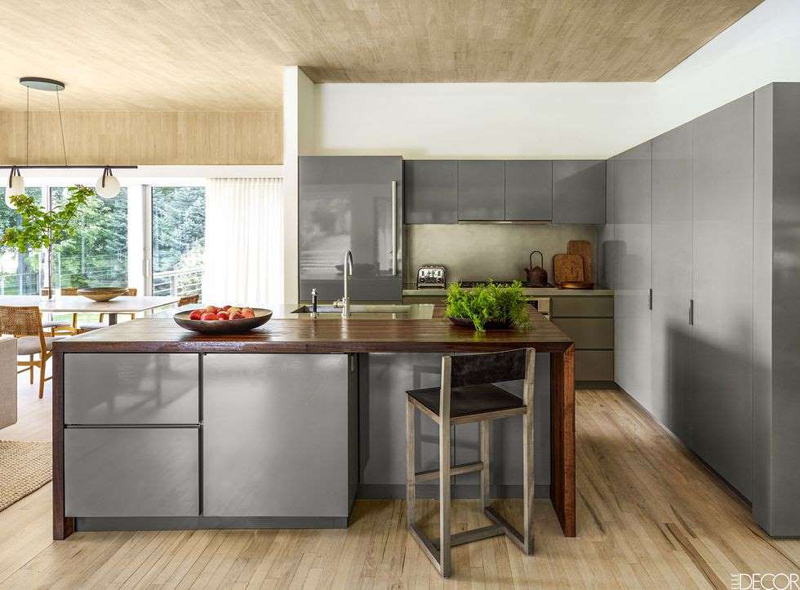 But these modern kitchen cabinet ideas-which are clean, streamlined, and entirely unencumbered-will give any space a fresh and orderly appeal. 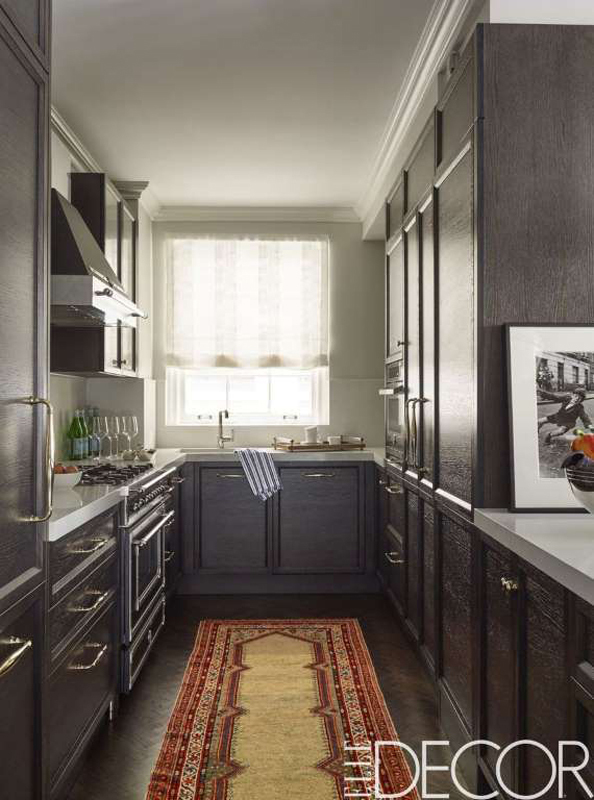 The kitchen of this 1840's townhouse in Low Manhattan has custom cabinetry painted in Benjamin Moore’s Kendall Charcoal. 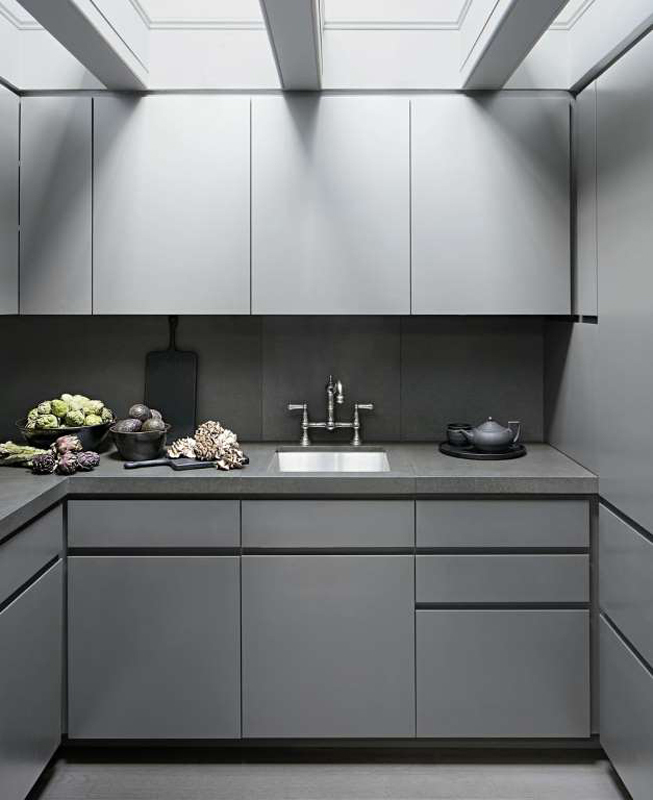 The counter is Inca Gray basalt, and the sink fittings are by Perrin & Rowe. In the kitchen of this renovated spec home, natural light complements the custom cerused oak kitchen cabinetry with custom brass detailing. 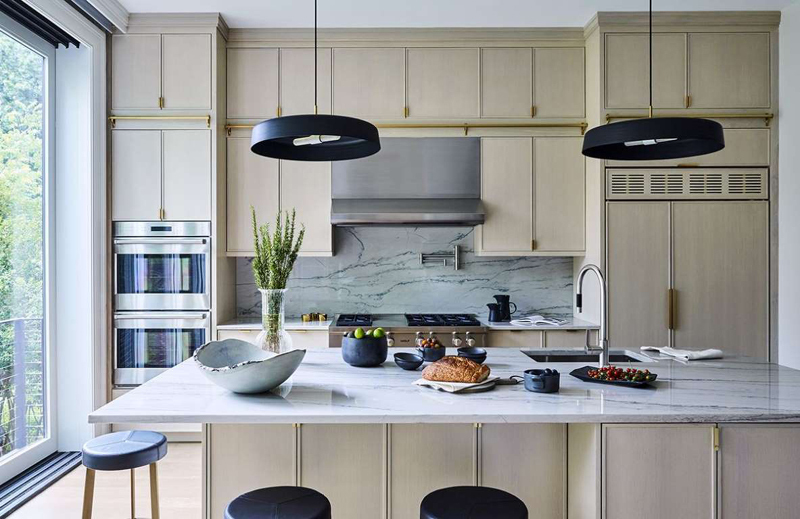 Circular pendant lights from Lambert & Fils provide contrast and bring out streaks of black in the marble countertops and backsplash from Marble America in New Rochelle, New York. 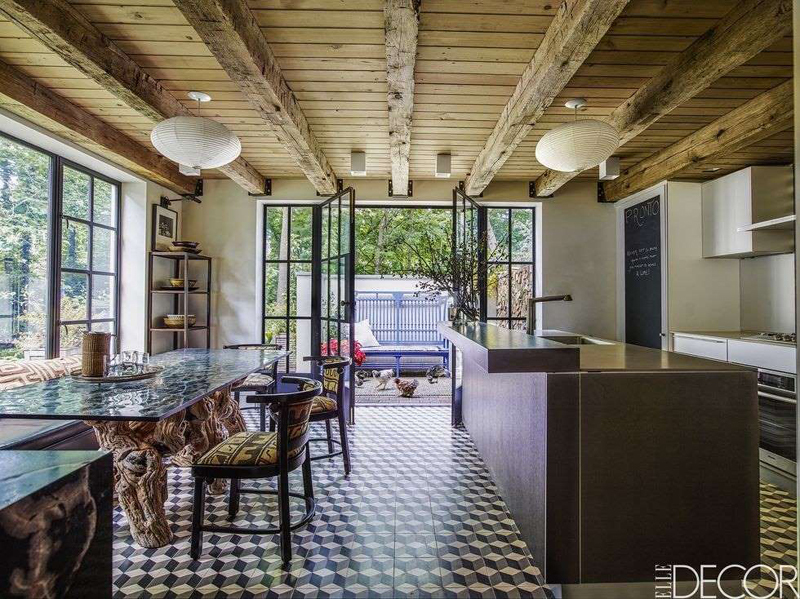 The stools were sourced from CB2, and the appliances, Wolf. 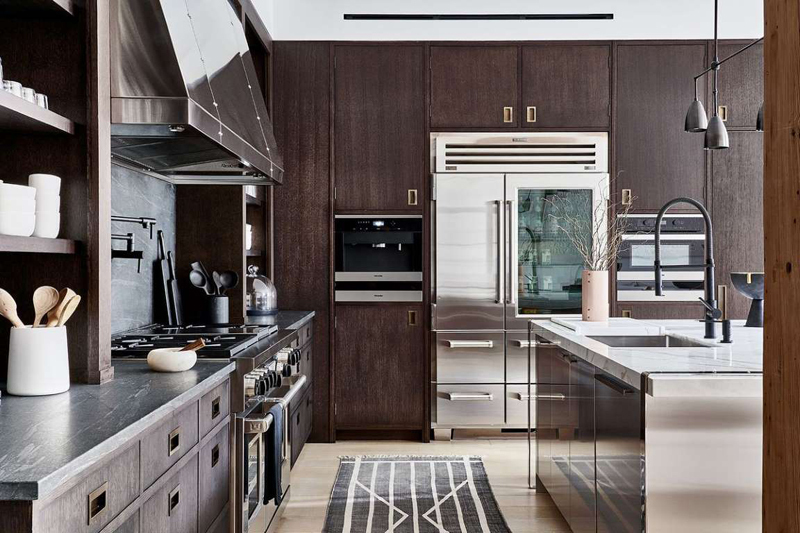 In this Tribeca loft, the separate open kitchen with its rich wood custom cabinetry was designed to support a large family, complete with a custom banquet by Nancy Nienberg + Joel Dean. 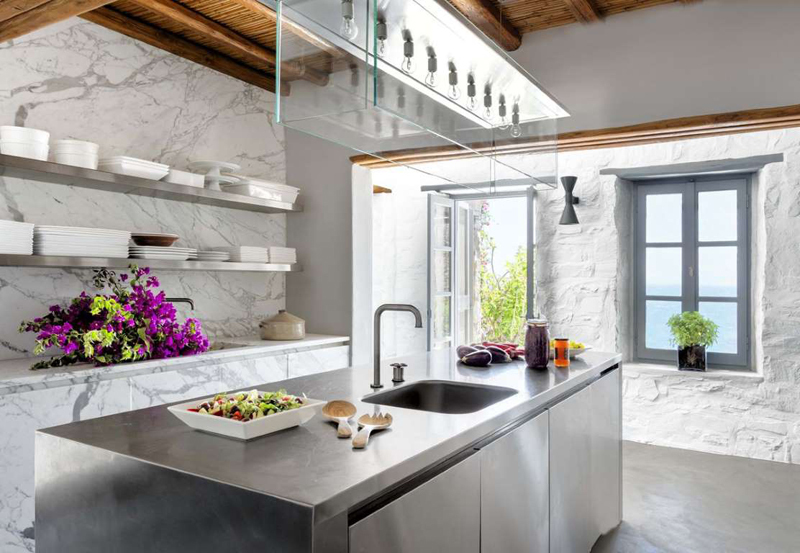 On an idyllic Aegean island, the kitchen’s custom island is in stainless steel, the sinks and fittings are by Marcel Wanders for Boffi, and the wall cabinets, counters, and backsplash are in Carrara marble. 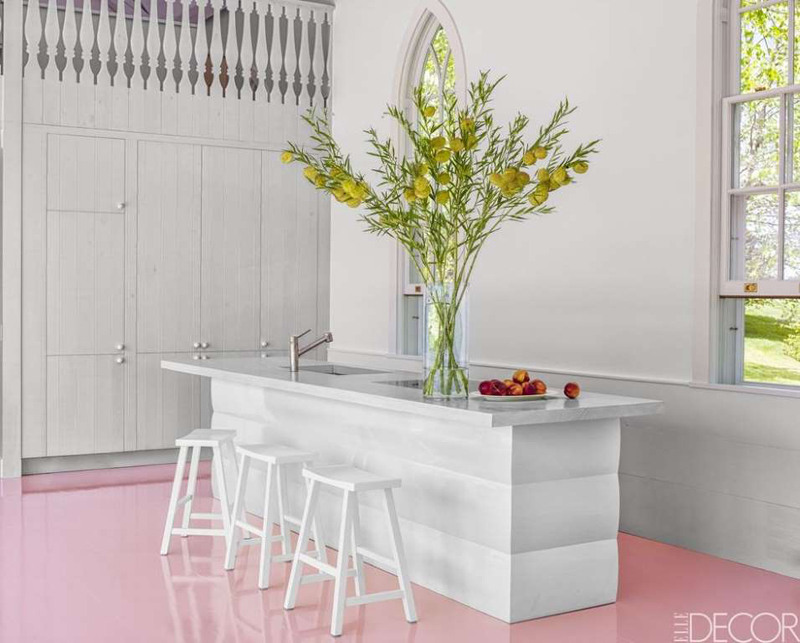 In an unconventional pool house, the kitchen island is topped with custom-painted white ash; the sink is by Julien, and the fittings are by KWC. 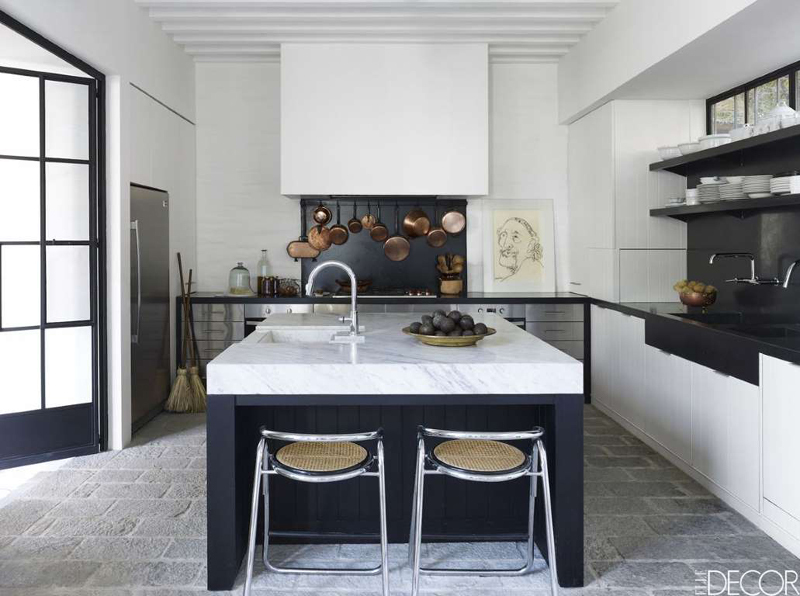 In a modern bachelor pad, the kitchen island is stainless steel and walnut, the sink is by Julien, the fittings are by Dornbracht, and the stool is by BDDW; the refrigerator and range are by Thermador, and the cabinetry is lacquered in a Ralph Lauren paint. 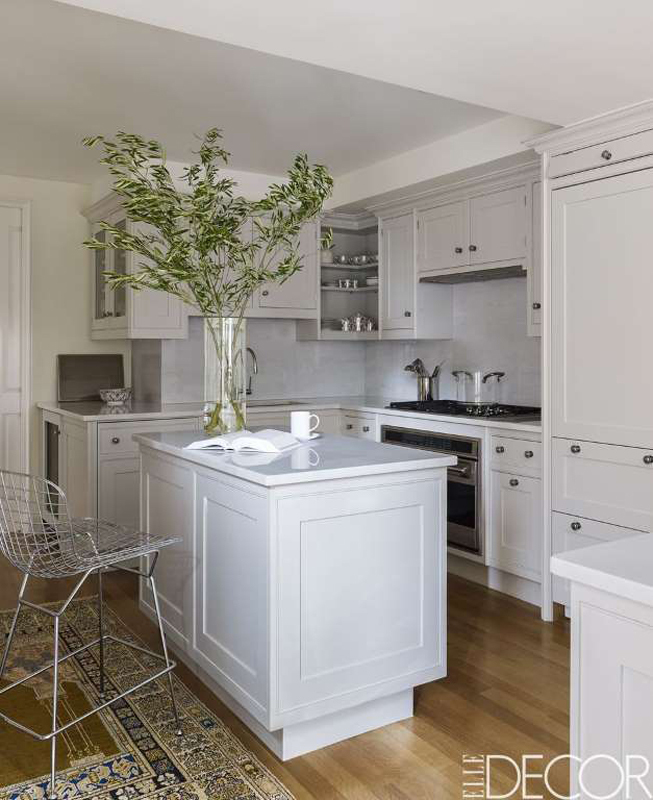 In a family-friendly New York apartment, the kitchen's range and microwave are by Wolf, the refrigerator is by Sub-Zero, the custom hood is by Vent-a-Hood, and the countertop is Calacatta Gold marble; Hans Wegner chairs, purchased at auction, flank a table by Eero Saarinen from Design Within Reach, and the vintage pendant light is by Max Ingrand for FontanaArte. 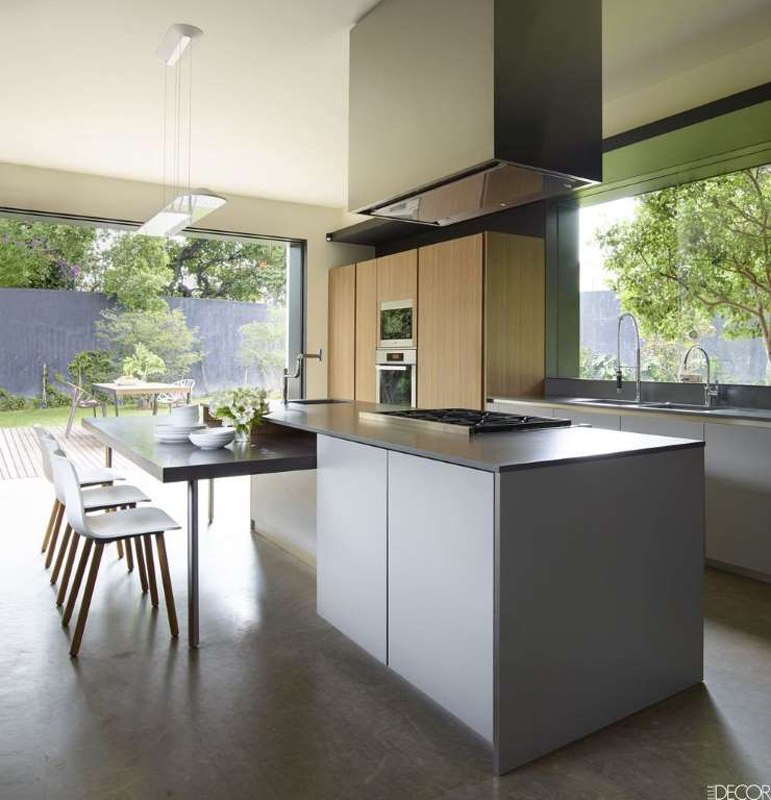 In a minimal Mexican home, the kitchen cabinetry, vent hood, and table are by Boffi, the countertop is Caesarstone, the sink fittings are by Dornbracht, the range is by Wolf, and the ovens are by Miele. 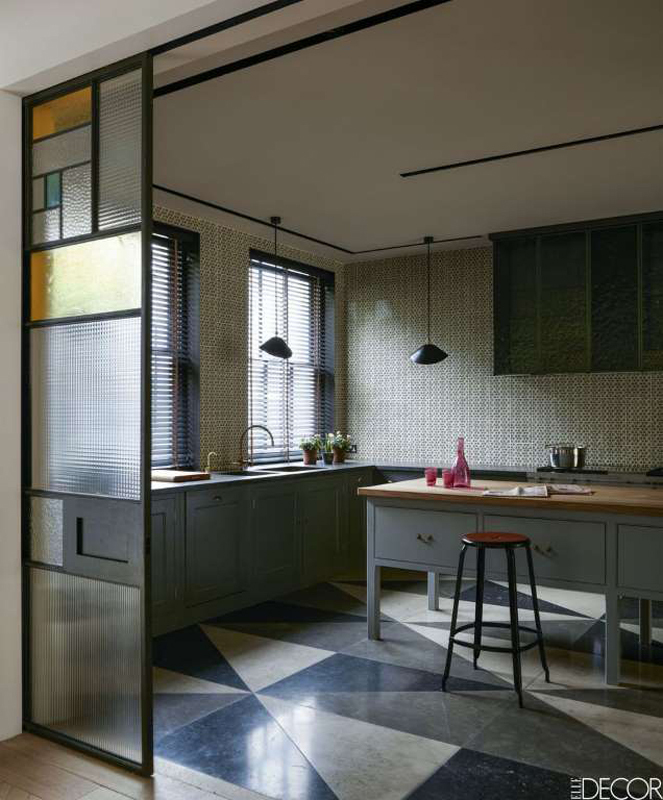 In a London townhouse, the kitchen cabinetry by Plain English is painted in Pure Grey 6 by Papers and Paints, the 1955 pendant lights are by Serge Mouille, the wall tiles are by Neisha Crosland, and the floor is made of three types of limestone. 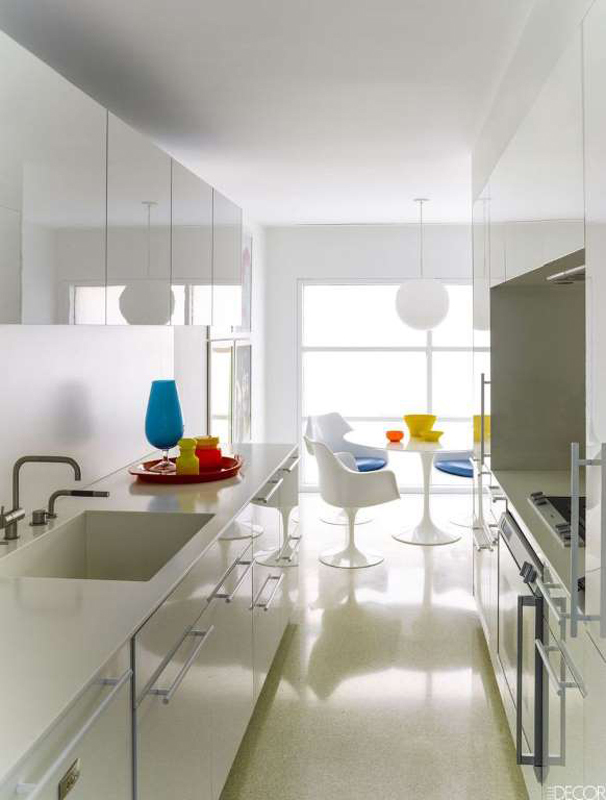 In a playful NYC apartment, the kitchen cabinetry is by Bulthaup, the countertop and sink are Corian, the fittings are by Vola, and the oven and cooktop are by Gaggenau; the light fixture is by Bega, and the floor is terrazzo. 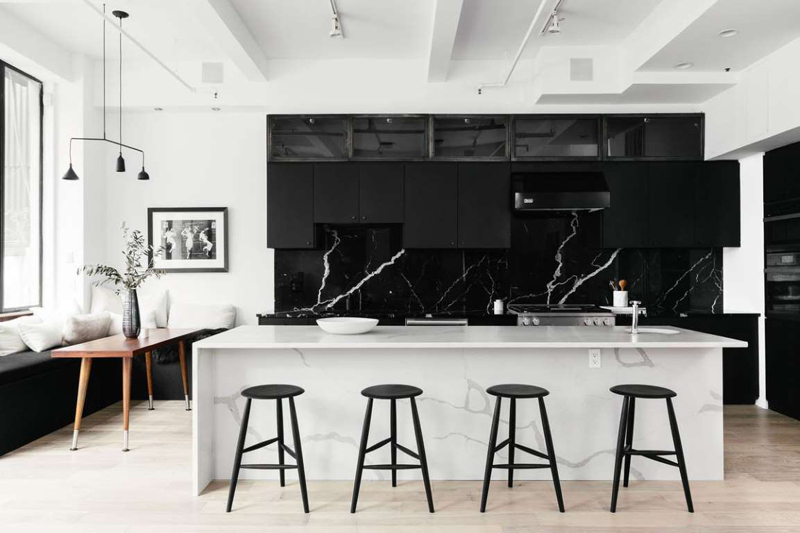 In the kitchen of Emmy Rossum's Manhattan apartment, the range and hood are by Bertazzoni, the cabinets are by Scavolini, the antique runner is from Stark and the photograph is by Roger Mayne. 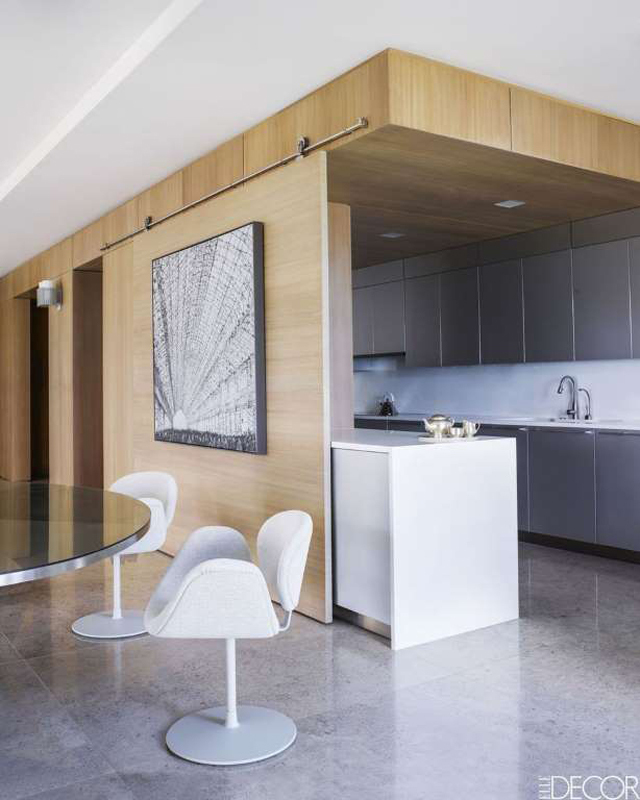 In a Palm Beach home, an artwork by Mircea Suciu hangs on the sliding wall of bleached mahogany that separates the kitchen from the dining area. 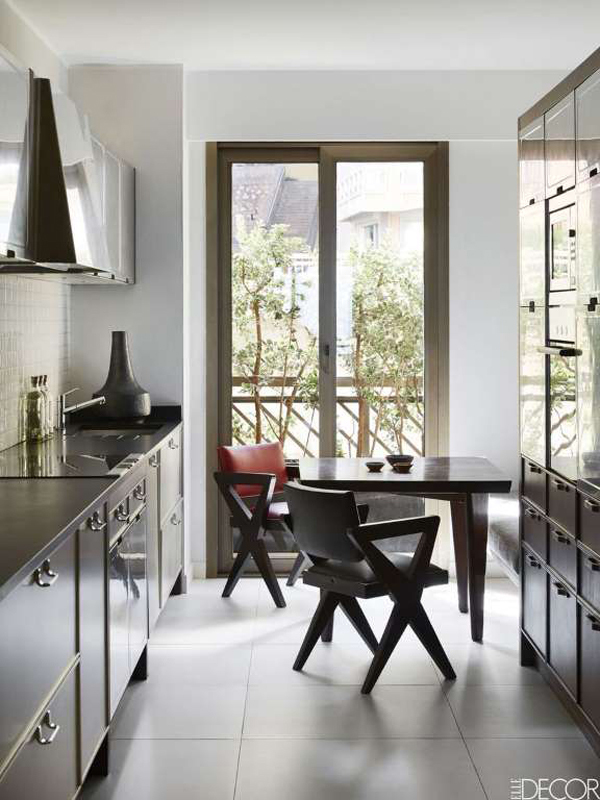 In a Monaco home, the kitchen table and chairs are by Jeanneret; the oven, cooktop, and hood are by Aster Cucine. 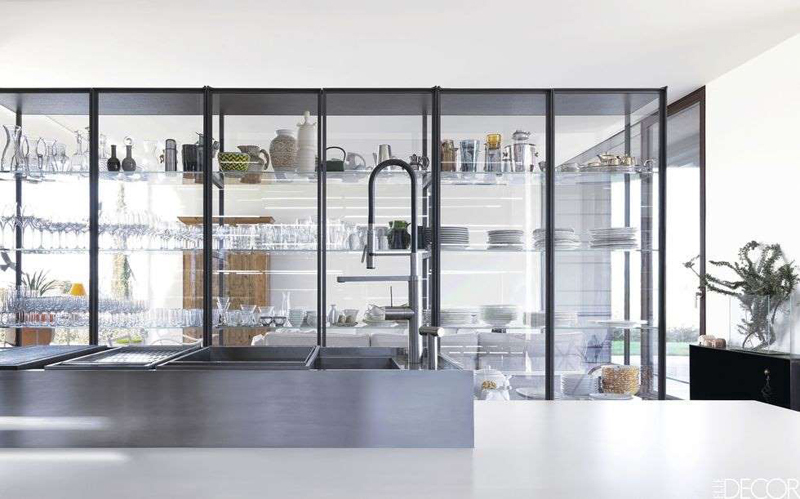 In a Tuscan home, the kitchen's stainless steel sink is a prototype of the one Lissoni designed for Boffi's Aprile collection, and the countertops are melamine. 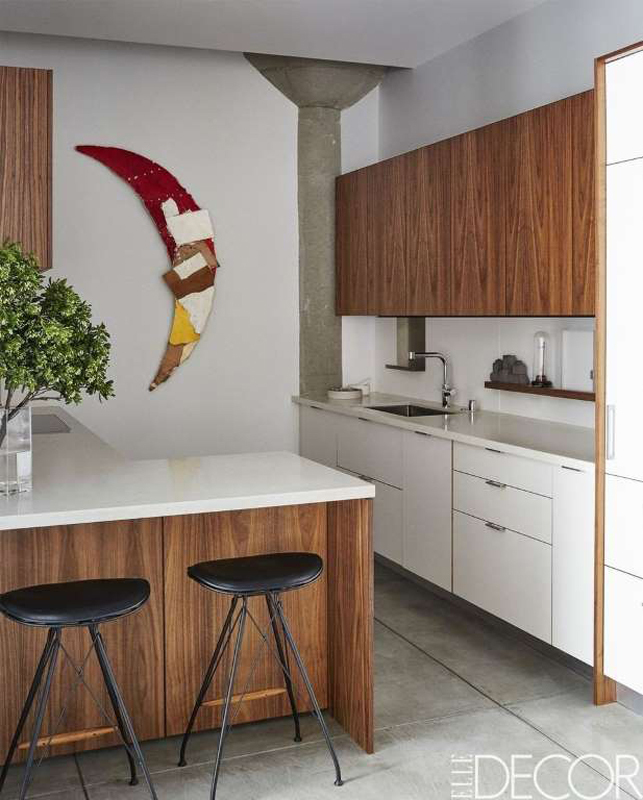 In a San Francisco loft, the kitchen’s cabinetry is by Henrybuilt, the countertops are PentalQuartz, the faucet is by Dornbracht, the stools are by Overgaard & Dyrman and the wall sculpture is by Manuel Neri. 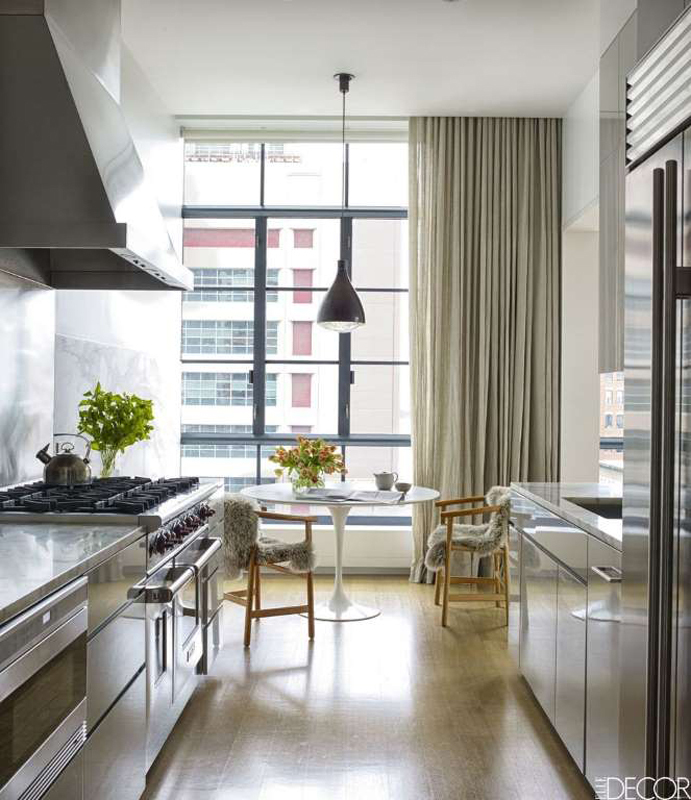 In a Gramercy Park apartment, the kitchen’s range is by Wolf, the sink and fittings are by Lefroy Brooks, the cabinetry is by Smallbone of Devizes and the Bertoia barstool is by Knoll. 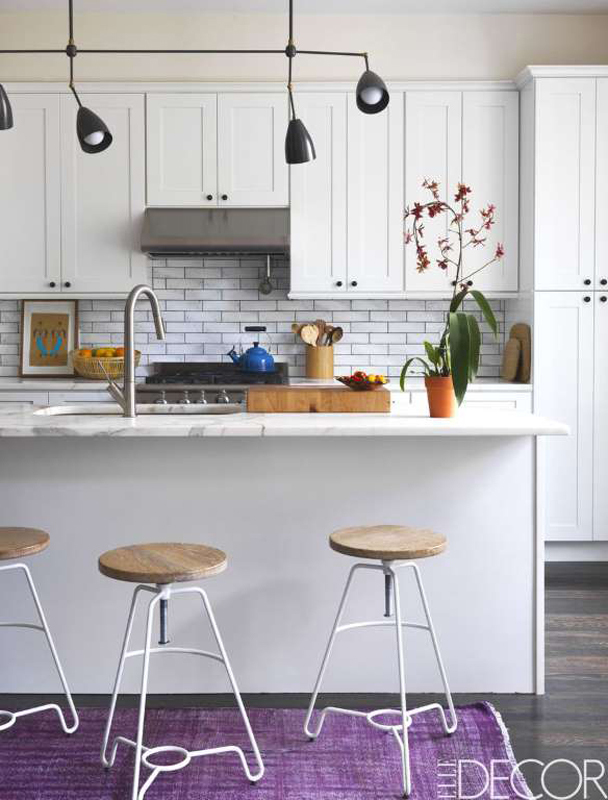 In a Brooklyn townhouse, the kitchen counters are Calacatta Gold marble, the backsplash tile is by Waterworks, the range is by Capital, the stools are from ABC Carpet & Home and the light fixture is by Apparatus. 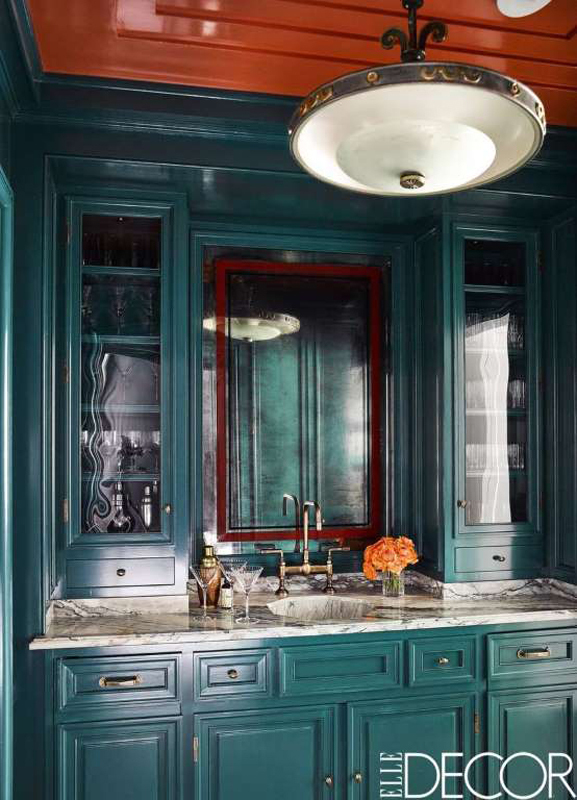 In Steven Gambrel's Chicago apartment, the sink fittings in the butler’s pantry are by Kallista, the counter is in Indigo Green marble, and the antique mirror is from Olde Good Things; the cabinetry was painted in a custom high-gloss lacquer matched to Pantone’s Mallard Green. 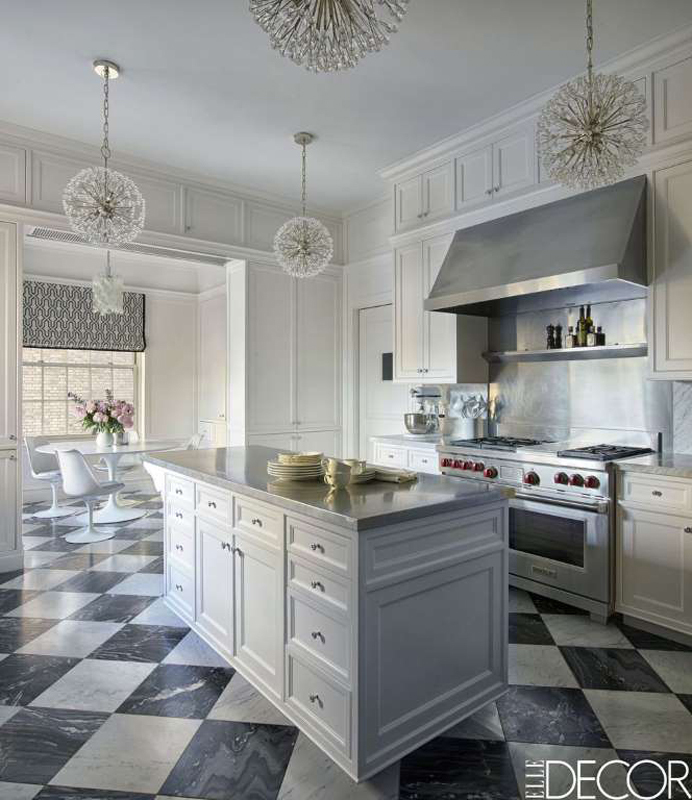 In an NYC apartment, the kitchen’s custom island is topped with brushed stainless steel, the range is by Wolf, the Saarinen table and chairs are from Knoll, and the Dandelion chandeliers by Tony Duquette are from Remains Lighting; the Roman shade is of a China Seas fabric with velvet trim from Duralee, and the floor tiles are by Paris Ceramics.